Creating a custom made ring is an exciting and very rewarding experience, one that takes some consideration but is worth it in the long run. Before you decide to go down this path, it is important to understand why you would want to. Here are four reasons why you should choose to custom make your engagement ring. Designing your very own ring gives you a chance to show off your unique personality and individual characteristics. Shopping from a traditional vendor offers limited opportunities for ring customization. However, when designing a bespoke ring from sketch to finished product with a jeweller, you decide upon every element. You get to choose the diamond or gemstone shape, diamond clarity and size, style of band and other intricate detailing according to the specifications you give the jeweller. A custom-made ring gives you complete creative control over all the details, so you can tell the story of your unique partnership. Another very attractive reason to custom make your very own engagement ring is you can utilise your budget more effectively when compared to buying a ready made ring. You will be able to select exactly what features you do and do not want to be included in your ring and your jeweller will be able to guide you on where you can afford to make sensible budget decisions that won’t compromise the overall looks/feel of the ring. Through direct interaction with your chosen jeweller, you can communicate exactly what your engagement ring needs are and, if chosen carefully, the jeweller will provide sound advice on quality, designs and features to select with your specific budget. The jeweller will pay attention to your preferences and provide insight into other potential options before creating your perfect custom made ring. An engagement ring should be a unique expression of your partnership and symbolize the beginning of a life-long partnership in a meaningful way. Getting engaged is a huge moment in any couple’s lives and the ring symbolises and captures this moment in time forever. Going about the process together to decide exactly what elements are to be included in the ring design is an intimate and bonding experience for both partners. If you’re in two minds about whether to custom make your engagement ring or not, consider the aforementioned reasons. Speak to your partner about what's important to them and take your time. Choosing the right jeweller to take you along the customisation journey is key to producing the perfect end result. Make sure they are a reputable, trusted name in the industry and easily adapt the brief to your needs. 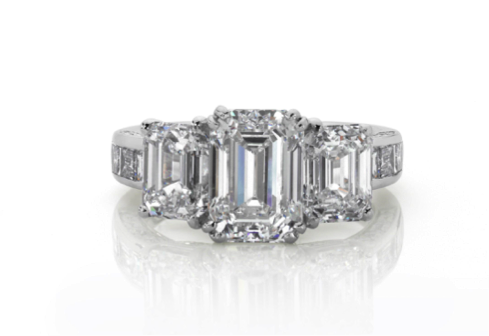 Discover the wider collection of diamond jewellery and watches at J Farren-Price Sydney. In 2017 Farren-Price celebrated 75 years of offering exquisite products to discerning clientele. Established in 1942 by John Farren-Price the business today is still family run by his wife Krysten and son Julian. For over three quarters of a century the company has developed an outstanding international collection of finest watch brands including Patek Philippe, Rolex, Vacheron Constantin, Greubel Forsey, Jaeger LeCoultre, Panerai Hublot, IWC, Chopard, Longines, Tudor. In fact they are the longest standing representative of Patek Philippe and Rolex in Australia.